MEMPHIS -- Almost a year ago, as the Oklahoma City Thunder's once-promising season was withering during an unpleasant week in Memphis, they had an obvious crutch: one of their superstars literally being on crutches. The Grizzlies ended up executing the reverse gentleman's sweep, the lower seed winning in five as the Thunder felt increasingly powerless as they slowly went through the stages of loss over what Russell Westbrook's knee injury had truly meant. That bit of recent history makes the Thunder's sudden 2-1 deficit after the Grizzlies' 98-95 Game 3 overtime win this year all the more complex. Especially considering, at times, it looks like the Thunder are still playing with just one of their superstars. 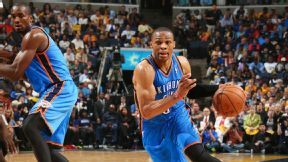 Joe Murphy/NBAE/Getty Images Russell Westbrook and Kevin Durant both scored 30 points Thursday night but seemed off their games. There's a selection of intriguing things unfolding in this juicy first-round series, but none bolder than the deep slump both Kevin Durant and a now-healthy Westbrook have swiftly veered into. And how little they're relying on each other to get out of it thus far. The Grizzlies had a seven-minute scoring drought in the fourth quarter Thursday, blowing a 17-point lead. They attempted a single free throw in the third and fourth quarters combined. Then, for the second time this week they allowed a four-point play in the final 30 seconds that gifted the Thunder an overtime session. Comprehending that happening twice -- this time it was Westbrook scoring after getting whacked on what Tony Allen called "a bonehead play by myself" -- and then recovering to win twice in overtime requires the services of an actuary. Typically, if Durant is afforded a spare foot, he will bury you with is unrelenting offensive firepower. Instead he's had his two worst shooting games in a year; he missed 33 shots over two playoff games against the Grizzlies last season, as he's done in the two games this week. Westbrook's attempts have been equally as futile and, at times, more damaging. They both scored 30 points in Game 3, which should be impressive. That's the sort of one-two punch they've trademarked. But this is a prime example of how box scores can lie, getting there was a wild, often eye-rolling ride. Durant has again missed 33 shots in the past two games after going 10-of-27 in Game 3, but this time it wasn't because Westbrook wasn't there to help. Durant was 1-of-13 shooting outside 10 feet, the worst jump-shooting game he's had since a game in November 2009, when he went 0-of-15. Thursday he was 0-of-8 on 3-pointers. In the past two games, he's just 5-of-20 from deep, and one of them was a falling-out-of-bounds-after-being-fouled shot that was OKC's first 4-pointer of the week. "When he shoots, you just assume he's going to make it," Grizzlies coach Dave Joerger said. "He's more capable of going 7-for-8 than going 0-for-8." Westbrook is 20-of-54 over the past two games after a 9-of-26 showing in Game 3. That's 67 misses between the two over a 72-hour stretch. Looking at that alone, the Thunder seemed to collectively shrug off the back-to-back losses while placing their faith in the law of averages. This is reasonable but also might be a little dangerous. There's more than just a blip taking place. "We're a shot-making team, we've been a high-field goal percentage team all season long, and I expect the guys to come back and make them," Thunder coach Scott Brooks said. "They're going to play much better. They're going to get an opportunity [in Game 4]. The ball hasn't fallen in two games. I believe in our guys, they've put a lot of time in." There is no doubt the Grizzlies are well prepared for their opponent. Directing his first playoff series, Joerger has schooled his team well. They generally know the Thunder's plays, and they are routinely shutting down the first option. This, however, is typical playoff business for a well-coached and well-drilled team, which the Grizzlies are. Where it has been going off script is what happens when the Thunder run into their first road block. Durant and Westbrook have just been breaking off the options and trying to do it themselves. It's one thing not to pass to Kendrick Perkins or just not trust Reggie Jackson -- who has been a complete nonfactor after a breakout regular season and is just 3-of-19 shooting in the three games. But Westbrook and Durant aren't even looking to each other much, acting as if one of them isn't even out there at times. The number of possessions on which they go 1-on-3 or worse are piling up. Their last mistake summarized it. Down three points with 40 seconds in overtime, and not needing a 3-pointer, Westbrook launched a 27-footer while Serge Ibaka stood alone near the basket. When chance allowed an offensive rebound, Durant hoisted a 29-footer while being covered well. That's not to say he shouldn't be the guy taking that shot, but not at least trying to get some help to get it off spoke to the way he's begun pressing by himself. This style of play is compounding, of course. When they're at their worst, Durant and Westbrook sometimes won't pass to or screen for each other. "I took some bad ones," Westbrook admitted. "A lot of them I took when we needed them." True enough, Westbrook led the comeback drive with a flurry of forced attacks, but his sense of "need" has always been prone to skew a bit off course. In fact, that very topic has been one of the league's more polarizing over the past few years. Looking at it more on a micro scale, watching Westbrook and Durant force shot after shot Thursday, regardless of the score, was more the problem than the solution. They combined for just five assists Thursday, which sort of says it all. Over these past two games, Grizzlies backup guard Beno Udrih, pressed into service by Nick Calathes' suspension, has shot 11-of-14. Tony Allen, not known as an offensive force to say the least, is 11-of-19 after a 16-point outburst in Memphis' Game 3 win. For Udrih and Allen to be a vastly more efficient duo than Westbrook and Durant summarizes what has been developing in this series. It also hints that it will not last. Assumptions so far, though, have been a dangerous thing. "We just have to be better next game, just have to be," Durant said. "We're down 2-1, and we don't want to go into a bigger hole than that. We just have to believe in each other and stick together." MVP: Zach Randolph. Z-Bo didn't shoot it all that well, but he had an otherwise great all-around game with 16 points, 10 rebounds and six assists. Time and again, Memphis went to him in the low post, where Kendrick Perkins (five fouls) was just no match for him. X factor: Tony Allen. This was the most Tony Allen game ever. He had his brilliant moments -- a first-half scoring tear and suffocating defense on Kevin Durant -- and his boneheaded moments, none more so than when he fouled Russell Westbrook on a 3-pointer with a second left in the game. the Grizzlies losing a late, large lead? Check. A Thunder star making an improbable four-point play? Check! Overtime? Check! Sounds like déjà vu to me. MVP: For as unstoppable as Blake Griffin was offensively, tonight was about DeAndre Jordan's dominance. The human pogo stick tallied his best game of the series with 14 points, 22 rebounds and five blocks. He's looked like a man among boys and has pushed around whomever the Warriors have thrown at him. Defining moment: Draymond Green's flagrant foul on Griffin. The play symbolized Green's toughness, defensive effort and helped spark a 10-3 run that snowballed into a massive comeback. If not for the hard hit, this game might have been a rout. too close to call: Stephen Curry's 3-point heave to win the game fell short, in large part because of Chris Paul's stellar on-ball defense. But was it a foul? The replay showed Paul's hand made contact with Curry's elbow, but no call was made. Blake Griffin, Clippers: Blake had his second straight stellar game of the series, finishing with 32 points, eight rebounds and three assists as L.A. took a 2-1 series lead over Golden State. Indiana Pacers: Indy's offense apparently hasn't made the trip to Atlanta. Adding to the ongoing struggles of Roy Hibbert -- who sat the entire fourth quarter and finished with four points -- Paul George and George Hill combined for 16 points on 4-of-22 shooting. Yikes. "A lot of times, those plays that you draw up don't work the way that you want them to. You improvise and sometimes you throw stuff up as the shot clock's coming down and it goes in. I'm glad that it happened for us and not for them." -- Hawks guard Kyle Korver, on Jeff Teague's off-balance 3-pointer that helped Atlanta take Game 3. Scott Cunningham/NBAE/Getty Images What's more shocking: the Hawks' 2-1 series lead or Jeff Teague's miraculous 3-pointer going out of bounds? Since the first round expanded to seven games in 2003, the Pacers are the fifth No. 1 seed to trail 2-1. Three of the previous four top seeds to do it lost in six games. Only the Pistons in 2003, who trailed 3-1, came back to win the series. 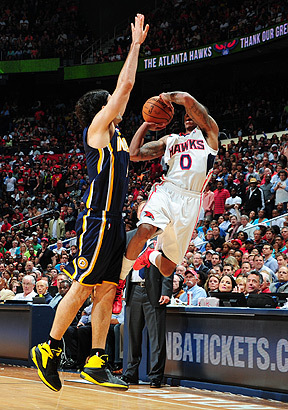 MVP: Jeff Teague, who notched a double-double with 22 points and 10 assists. Teague came alive on offense in the second half, punctuated by two highlight-reel tomahawk dunks and a crazy, fallaway 3-pointer that was launched just in time to beat the shot clock. LVP: Again, it's Roy Hibbert, who was 2-for-9 from the field and finished the game with just four points and two rebounds. His performance resulted in him spending the entire fourth quarter on the bench. X factor: In a game filled with poor offense, Kyle Korver and DeMarre Carroll pushed the Hawks ahead. Korver and Carroll were a combined 12-for-17 from the field and 6-for-11 from behind the arc.